Our award-winning and nationally recognized dietitian and nutrition team are here to make sure you have a fresh and healthy experience when you eat with the Pack. Throughout our operations, we place a special emphasis on fresh foods and wellness to help you pursue a healthier lifestyle that can be embraced long after your time at NC State. This includes educating students, offering healthy food choices, providing effective and informative food labeling, and encouraging wellness activities. Check out the Nutrition Guide for an overview of our Nutrition and Wellness program here at NC State. Also check out the NC State Wellness module. If fresh and healthy food is what you crave, you’ll find it at every turn. Our award-winning nutrition team is here to help you make healthy eating even easier with our Dietitian’s Dish and Wolf Approved programs. Receive nutrition updates, health and wellness tips, recipes, prizes and more by following @WellFedWolfpack on Instagram and Twitter or checkout our Well-Fed Wolfpack Tips page. In 2018, NC State Dining joined The Menus of Change University Research Collaborative, a national collaborative of leading scholars, foodservice business leaders, and executive chefs from invited colleges and universities who are accelerating efforts to move Americans toward healthier, more sustainable, plant-forward diets. Each month, we will focus on one of the 24 Menus of Change Principles of healthy and sustainable menus. These principles offer guidance to our nutrition and culinary team for menu design and innovation, while outlining pivotal culinary strategies designed to promote a positive impact on the life-long food choices of our campus community. Menus of Change has grown to involve some of the nation’s most influential and well-respected leaders on health, sustainability, and food in guiding its future work, and NC State Dining is excited to join their collegiate challenge. 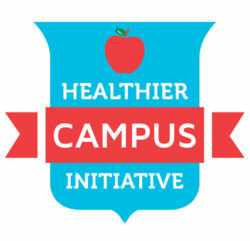 The Healthier Campus Initiative began in 2014 as part of First Lady Michelle Obama’s Partnership for a Healthier America (PHA) program. PHA is a nonpartisan, nonprofit organization that is led by some of the nation’s most respected health and childhood obesity experts. The Partnership focuses on working with the private sector to ensure the health of our nation’s youth by solving the childhood obesity crisis. NC State was one of the inaugural 20 colleges and universities to initially sign on to a three-year commitment to adopt the PHA guidelines focused around nutrition, physical activity and programming. 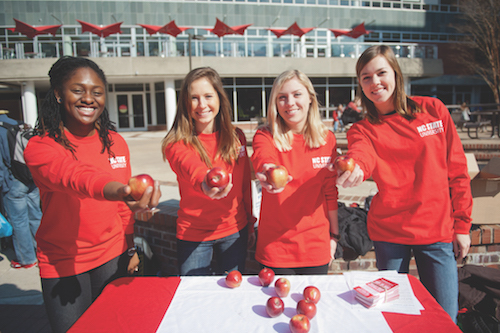 In 2015, implementing all 23 guidelines two years ahead of schedule, NC State was the first campus in the nation to successfully complete the Healthier Campus Initiative, encouraging healthier options among the more than 40,000 students, faculty and staff on campus each year.